What type of vinyl do you use? I use a special clothing vinyl applied at high heat and pressure to assure a perfect finish. Permanent vinyl – perfect for drinkware and decor items. Temporary vinyl – perfect for wall decals and stencils. Removable for up to 2 years. How do I apply my decals? Using the included transfer medium, you will be able to transfer your decal easily to its final destination. Just rub it on and remove the transfer paper gently. That easy! What type of stencils do you offer? If you plan on using the stencil more than once, pick the reusable option. Made of 7.5mil mylar it can be washed and reused often. If you are making an intricate designs or only one item with the stencil,pick the one-time use stencil. It is made of a sticky stencil vinyl perfect for those projects. No clean up, easy to use. How do I take care of my product? Apparel can be machine washed in cold water and should be hung to dry for a long lasting design. Being a busy mom, I have been throwing my own in the dryer on normal/low heat and it is usually fine… but I cannot and will not guarantee it. Products with decals should be hand washed. They are not meant to soak or go into the microwave and dishwasher. Reusable stencils should be cleaned as soon as possible with warm water and soap. Send me a request via email or social media and we will be in touch as to what you want and need. Do you create your own designs? While I do design some, I often rely on other designers. All the designs are used under the designers respective Small Business or Commercial Licence. I credit the designer where possible. If a mistake was made and you see your design but no credit or the improper credit, please contact me and I will fix that! No! Order 1 or 100, whatever you need. Do you offer a volume discount? Yes I do! If you order more than 20 of the same items (but can be different sizes), I offer 10% discount. Yes I do, under certain conditions. Please contact me at karina@triplenacres.com if you are interested in reselling my product. Oups… we are doing it again! 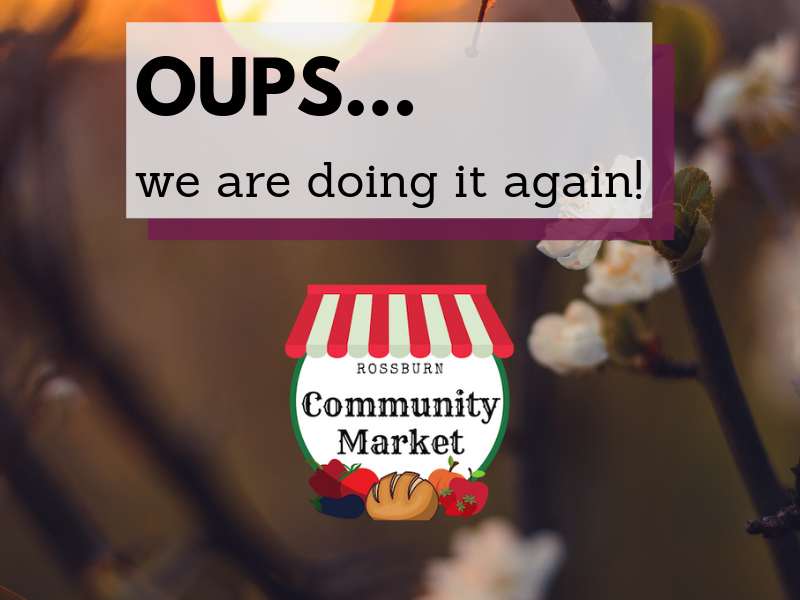 We have joined forces this year with the Rossburn Recreation Commission to bring you the 2019 Community Market! We took out combined experiences of the past 3 years and are planning the best market yet.